Face of Avon: Start your skin care regimen now. Start your skin care regimen now. 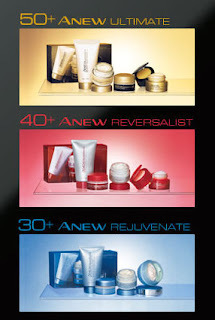 Theres no better time to try Avon's Anew line to see if its right for you. Everyone needs a skin care regimen no matter what age you are. You can start young to prevent wrinkles or when your older to reverse them. No matter what age you are Avon has a starter kit for you. Why spend hundreds of dollars to find out you don't like the product or it doesn't work for you? Now you can try the four piece starter kit according to your age based needs. Why use a skin care regimen? 97% of dermatologists agree, The best way to treat and protect your skin is to start a daily anti-aging skin care regimen as early as possible. Avon makes it easy to try the whole line for only $25.00. If your not happy with it you can get a full refund. Who else offers that? Don't put your skin care needs off any longer. Order your kit now and get free shipping.